How can the tension in our life be part of the framework that God uses to mold us and teach us to trust Him? Bronlynn shares and interesting fact. “The Lord is my strength and my song; he has become my salvation” (Psalm 118:14). I have been blessed to be part of contemporary worship teams for quite a few years now. I play the piano, but I recently learned some information about the guitar that is quite interesting. Many guitars have something called a truss rod in the neck. This rod is required for guitars with high tension strings. Without this rod, the natural tendency of the wooden neck is to bend beyond repair due to the tension from the strings. Tension is not the only thing that can bend the neck. Changes in environment and temperature can also cause it to warp, twist, or even break. The truss rod protects the guitar from becoming permanently damaged due to any of these causes. I thought about how well this concept pertains to our lives. Pain and illness create a lot of tension. Sometimes we feel the pressure is too great for us to endure. 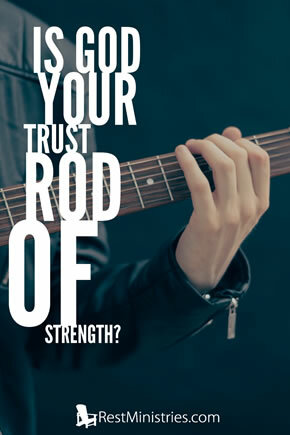 We may have circumstantial or environmental stressors as well, but the truss rod of God’s strength keeps us from bending and breaking. We may seem to be damaged now, but we know it’s not permanent. Eternal perfection is coming. The original meaning of the word truss was something that ties or binds, and today it describes a type of supporting framework. God is the supporting framework who holds us together. And as we bind ourselves to Him, we can keep praising and trusting Him through the most tense and stressful times. When we bend, He straightens us. We will not break. The word “truss” sounds very much like the word “trust”, doesn’t it? God is our “trust” rod at all times, enabling us to handle all the tensions and problems we face. He truly is our strength, our song, and our salvation. Prayer: O Lord, many times I begin to bend under the tensions of my pain and problems. Sometimes I feel as though I am going to break from the strain of life’s stresses and my own weaknesses. But I thank You that no matter how great the tension, the trust rod of Your faithfulness and strength support me. Amen. About the author: Bronlynn Spindler lives in North Carolina and is blessed to have the support and encouragement of a wonderful husband, three daughters, and their husbands. God’s grace and strength have brought her through thyroid cancer and continue to sustain her through ongoing back pain, depression, headaches, multiple sensitivities, and fibromyalgia. You may view her blog of devotionals at www.aplaceofsprings57.blogspot.com. How have you seen God strengthening and supporting you through your pain or illness lately? Thank you for sharing. …I have been enduring 3 years of digestive and intestinal difficulties that are worsening to the point that I cannot eat w/o debilitating pain. I’ve had an abdominal CT scan, and endoscopy, but the VA says they can’t find a cause, so it must be psychosomatic. I have no other insurance, and God has been silent. I don’t feel I can go on much longer, and it’s getting harder to pray. …maybe it’s punishment for having walked away from God years ago when I left my wife and kids… maybe no more sacrifice for sins remains for me, as Paul says in Hebrews… maybe this my lot now until judgment – When I’ll be cast into hell? I have been through times of great trials and struggles when it seems that God was not answering or hearing my cries, but in retrospect later, I saw that He was always there and working in my life to conform me more to HIs image and grow in faithfulness and trust. Please don’t feel He has abandoned you or that your sins are not forgiven. If you are truly trusting Jesus, seeing your sin and need of Him, and want Him to be Lord of your life, your sins – past, present and future – are forgiven completely. Sometimes He allows us to learn difficult lessons through our mistakes, but it’s all done in love. Don’t give up on praying, even if all you can say is, “Jesus help me”. He will. He’s there and He loves you, and He has a plan for your life. Thanks Sarah :). I don’t know how people keep going without God’s strength! So thankful we have it! Tofays devotional came for me just at the perfect timing and gave me comfort and encouragement. I was feeling upset and discouraged when I picked up my I pad and saw the devotional e mail, thank you. I’m so glad the devotional encouraged you. Aren’t we glad God keeps holding us together through all our challenges and discouragement! Loved the imagery here Bronlynn and seemed very appropriate for me just now! “God is the supporting framework who holds us together. When we bend, He straightens us. We will not break.” Such good truth to hold on to. Thanks Fiona. You are a shining example of God’s rod holding you up :). Thank you very much for today’s devotional, Bronlynn! This is well written and I find your analogy to be so perfect for this message. Thank you for taking the time, energy, and thoughtfulness to write these encouraging things! I’m thankful God used this to bless you! it’s a great illustration of the the Lord keeping us from breaking when the tension coming from our illness seems to be too much for us. I just went through a tough decision that caused me a lot of stress. But I know God led me to the right one, even though it was not the one I wanted. He brought me through that process and I am sensing His peace. Thanks Beth. Glad to hear you followed God’s voice on your decision. I pray it works out for your best, as He promises it will :). I have vague memories of learning about truss rods WAY back in my high school music lessons, but wasn’t a Christian then. Sooo great to hear about it now & the analogy. Special! Thanks Kerryn :). I pray you are hanging in there!